In 2007 Kawasaki’s James Stewart was forced to bow out with a knee injury while leading the 450 series, while Pro Circuit Kawasaki’s Ryan Villopoto captured his second 250 title. Stewart’s departure allowed Yamaha’s Grant Langston to put on an incredible charge and capture the 450 championship. Well, Stewart would be forced to pull out of this season’s supercross title chase as well when that knee wasn’t healed enough. He went under the knife and it was touch-and-go for James to see if he would make the first outdoor race. Langston would be struck down with an eye problem in the off-season that prevented him from defending his championship and it would, effectively force the champ into retirement. A big blow to the series no doubt about it as the classy Langston was now out. 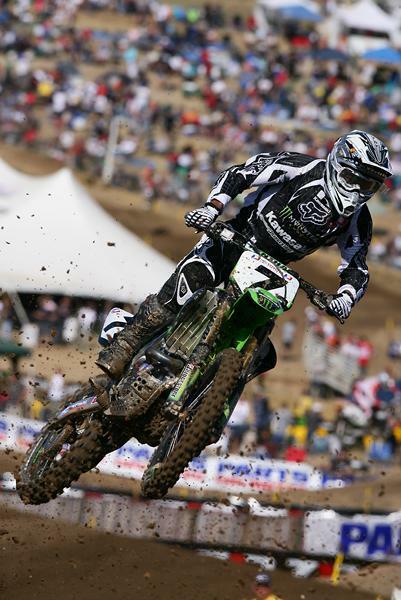 The series opened at Glen Helen in Southern California and indeed there was the #7 Kawasaki of Stewart on the line. With only a few weeks of practice under his belt, Stewart crushed everyone, putting double-digit seconds on the field in a precursor to what we would see the rest of the summer. Mike Alessi had switched from KTM to Suzuki in the off-season, and he went 2-2 behind Stewart while Honda’s Davi Millsaps went 3-3. In the 250 class, the very first moto of the year was won by bad boy Jason Lawrence on his Yamaha of Troy machine, but that would be about the highlight of the outdoor season for J-Law, as he soon pulled out with an injury. The Glen Helen overall was won by Pro Circuit’s Austin Stroupem, but that would be Stroupe’s highlight, as he later pulled out with an illness. At the next round in Hangtown we saw more of the same in the 450 class as Stewart went 1-1, Alessi 2-2, and Millsaps 3-5. As much as the 450 class was the same, the 250 class saw order restored with favorite Ryan Villopoto sweeping both motos, while we saw Suzuki’s Ryan Dungey continuing to step up to the next level and Stroupe hung in there near the front. And that, folks, is what we saw for the rest of the series, as James Stewart racked up win after win. In fact, he would go undefeated the rest of the summer and become just the second rider to sweep the entire season! Stewart was on another level this summer, amazing the crowd every weekend with his incredible skills. Alessi tried frantically to keep Stewart in sight and charged hard at the end of motos to make up the difference. It was small victories for Mike and he was clearly the second-best rider in the class until disaster struck at the halfway point of the nationals at RedBud. Mike went down on the first lap when he swapped out and almost the entire pack of riders used the 800 for traction in a very scary moment. That was it—Alessi didn’t have any really big injuries but he was done for the year. Stewart’s magical mystery winning tour continued, with the biggest challenge to “The Streak” coming from Suzuki City privateer Cody Cooper in the slop and mud of Unadilla. In the second moto, with the rain coming down, Cooper caught Stewart (helped out by a Stewart tip-over) and pressured him hard all the way to the end. But the streak did live on. Stewart’s teammate Tim Ferry would pick up the runner-up sword from Alessi and end the series in second, some 180 points behind James, as Stewart would wrap up the title early. Meanwhile, in the 250 class, Villopoto had a streak going himself—after losing the opening moto to Lawrence, RV ripped off sixteen motos in a row. 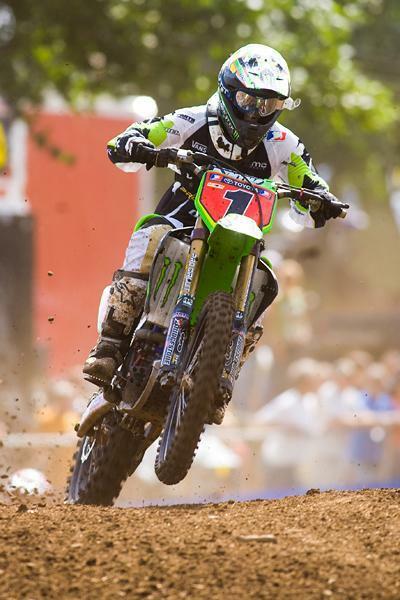 Establishing himself behind RV was Dungey and Villopoto’s teammate Brett Metcalfe. Honda’s Trey Canard was also in there, but only Dungey could put any sort of pressure on the the two-time champion. Finally, the streak was broken at Villopoto’s home track, Washougal, when Dungey managed to hold off RV and take the second-moto win and the overall. Dungey won again at his home track at Millville, Minnesota, and then again at the last race at Steel City when Villopoto DNF’d moto one with a shifter problem and then fell in the second moto. RV was done in the 250 class after this day, but before he left, he collected his third 250 national championship in row. 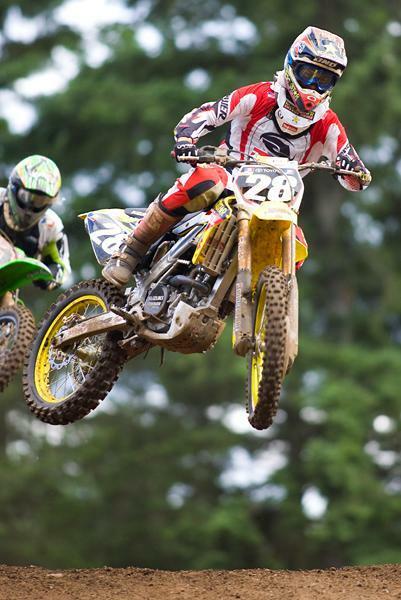 Ryan Dungey established himself as the next one and the favorite for 2009. The team of Stewart, Ferry, and Villopoto headed to England to defend their Motocross des Nations crown once again, and although things got tense in the third moto when Stewart crashed out, the team won once again when Ferry put in a great ride to get the necessary spots Team USA needed to win yet again. 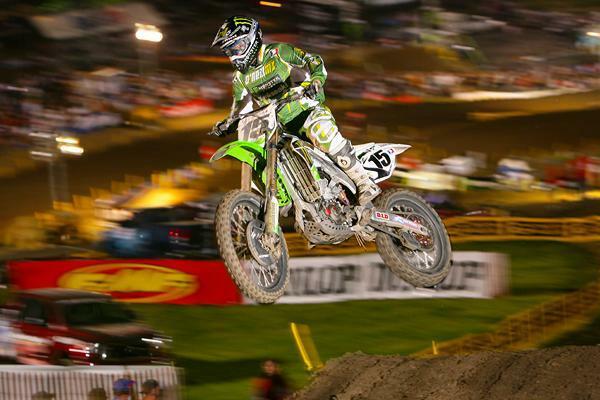 Stewart and Villopoto were both dominant in 2008 but neither would be around to defend their titles in 2009.